In my earlier post on food labels I introduced the key information required to make sense of food labels and understand what is in your food. In this second article I will provide guidelines on sugar, fat, fibre and salt, and show you how to compare different food products. The table below summarises where these ingredients and nutrients are found in common packaged foods. Reading the ingredients list allows you to identify whether any sources of sugar, fat, fibre or salt have been added to your food product. Remember that the ingredient listed first is present in the largest amount. Ingredients are listed from largest to smallest in quantity. Sugar comes in many different forms and may be listed in the ingredients list as sugar, brown sugar, honey, lactose or fructose for example. You might like to ready my tips on finding added sugar. A colleague of mine wrote a very nice summary of 48 sources of sugar in packaged foods, so I refer you to Catherine Saxelby’s article 48 Shades of Hidden Sugar. There are four main types of fats—saturated, monounsaturated, polyunsaturated and trans fats. The main fats that we need to reduce to improve our health are saturated and trans fats. Saturated fat comes from animal foods, coconut and palm, so may be listed as butter, cream, ghee, cheese, lard, coconut oil or palm oil. Saturated fat is commonly found in the following packaged foods; processed meats; fatty snack foods; pastries and pies, cakes, biscuits and desserts. Trans fats may be listed as partially hydrogenated vegetable oil or vegetable fat in the ingredients list. Foods that contain trans fat include bakery goods such as cakes, biscuits, pies and sausage rolls. Trans fats are not usually included in the nutrition panel (see next tip). I recommend eating foods that naturally contain fibre, rather than foods made from refined white flours that have grains or bran added back. In regards to cereal foods aim to have those that are made from ‘wholegrain’ or ‘wholemeal’. The best combination in a bread is one made from wholemeal flour that also contains wholegrains (kibble). So when it comes to fibre, the nutrition panel will be of most help. This article from Web Md provides an interesting overview of dietary fibres. The only column I encourage you to focus on in the nutrition panel is the 100g or 100ml. This the column allows you to compare products. The rule here is though, always compare products from the same category e.g. yoghurt, savoury cracker and breakfast cereal. The World Health Organisation recommends no more than 13 teaspoons of added sugar a day for adults. This includes what you personally add to your food and drinks, as well as that added in packaged foods. As mentioned in my earlier post, the only way to identify added sugar in packaged foods is by reading the ingredients list. Unfortunately the nutrition panel does not separate natural and added sugars. I suggest you ready my article for tips on added sugars. 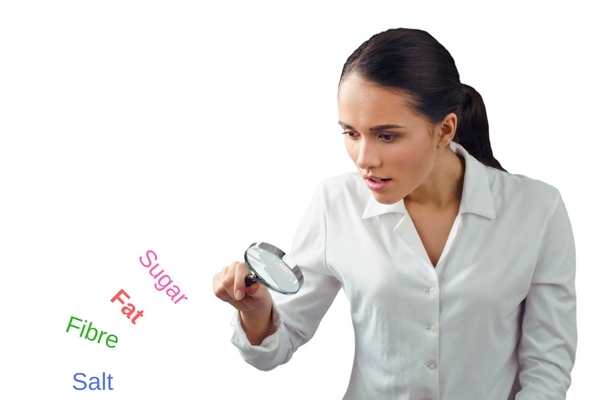 When comparing food products you are looking for the one with less sugar. Current Australian recommendations suggest that most adults require no more than 24g saturated fat per day, and up to 70g of all fats. When comparing food products you are looking to find the ones with less saturated fat. Australian adults are encouraged to eat at least 25–30g fibre per day. Ideally we would eat 30–40g daily. So, when choosing products that contain cereals and grains, look for those with the most fibre. Also aim to have your five vegetables and two fruits daily too. Salt’s technical name is sodium chloride. Sodium is the component of salt that affects our health. Current research suggests that adults consume no more than about 1,500mg sodium a day. This equates to about ¾ teaspoon of salt in total. The upper limit for sodium intake is 2,300mg, which is about 1 teaspoon of salt. I support the Heart Foundation recommendation of choosing foods that have 120mg sodium or less per 100g. What about the serving size information? I am less concerned about the nutrition panel information about the serving size of the food, because you may eat more or less than the recommended amount suggested. For example a serve size might be four biscuits but you only eat two. Make sense of food labels by 1) deciding on the nutrients you wish to assess, 2) reading the ingredients list and 3) reading the nutrition panel per 100g or 100ml column. If you wish to gain a better idea of how much sugar, saturated fat. fibre and salt you are eating, then I suggest keeping a food diary. You might like to follow the food diary guidelines recommended my article not more diets. For more tips on selecting foods that meet your personal needs, refer to the Eating for You book.